These Balsamic Pearls, or should we say Balsamic Caviar, are ideal to use in appetizers, entrees and desserts; the pearls are soft with a sweet and sour liquid center; a balsamic flavor. Sprinkle a few of these dark balsamic pearls on a dessert, in a cocktail, on top of your ice cream, but also in seafood and meat. When they become warm, they will lose shape. 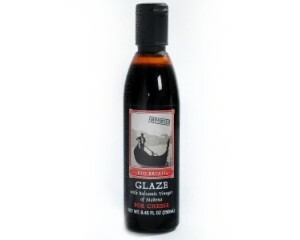 Ingredients:balsamic glaze [concentrated grape must, Balsamic Vinegar of Modena (wine vinegar, cooked grape must), modified starch], water, thickener, cellulose gum, gelling agent: calcium chloride, sodium alginate.